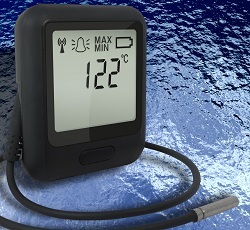 A NEW based data logging temperature sensor from Measurement Computing will continue to log readings even if its Wifi connection is lost. The WiFi-501-TP uses a Wifi network to send its readings wirelessly to a PC, where it can be viewed by the included software. The range of the device is dependent on the Wifi network, and if connection is lost the datalogger will continue to store readings until it is again able to communicate with the PC. This feature allows temperature records to be taken for up to 120 days at a ten-second sample interval. This WiFi-501-TP is a battery-powered device which typically operates for over a year under normal conditions, such as taking a reading once each minute. The software facilitates device set-up, data logging, and data review. Set-up features include sensor name, degrees C/F selection, sample rate, and high/low alarms. Once configured, historic data can be viewed via the graphing tool or exported to Excel. This 802.11b-compliant device includes a built-in data display and thermistor probe, and has a measurement range of -40C to +125C.